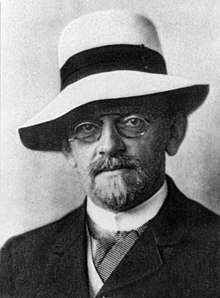 David Hilbert (23 Januar 1862 – 14 Februar 1943) wis a German mathemateician born in Wehlau, bi Königsberg, Prussie (nou Znamensk, bi Kaliningrad, Roushie) that is kent as ane o the maist influential mathemateicians o the late 1800s an aerlie 1900s. His ain discoveries themsels wad hae gien him that repute, yet it wis his leadership in mathematics aa throu his hindmaist years that disteinguishes him. He haed a professorship in mathematics at the Varsity o Göttingen for maist o his life. Hilbert solved a wheen important problems in the theory o invariants. Hilbert's basis theorem solved the kenspeckle problem in nineteent century invariant theory bi shawin that onie form o a particlar nummer o variables an o a gien degree haes a finite, but full seestem o independent raitional integral invariants an covariants. Forbye he unifee'd the field o algebraic nummer theory wi his 1897 treatise Zahlbericht ("report on nummers"). Weel kent for his abeility ti mak discoveries in monie mathematical fields, Hilbert gaed on ti provide the first correct an full axiomatisation o Euclidean geometry ti pit in place o Euclid's axiomatisation o geometrie, in his 1899 beuk Grundlagen der Geometrie ("Foonds o Geometrie"). See Hilbert's axioms. Forbye he laid the foonds o functional analysis bi studyin integral equations an formulatin a first version, in terms o quadratic forms in infinitely monie variables, o whit wad be cried Hilbert space. This wark turned oot in the 1920s ti be foondational for quantum mechanics. His interest in pheesics, in the decade 1900-1910, wisna sae important as later contacts wi Albert Einstein an formulations o general relativity that holped its mathematical respectabeility (see Einstein-Hilbert action an aa). Hilbert holped ti provide the basis for the theory o automata that wis later biggit upon bi computer scientist Alan Turing. He pit forth a maist influential leet o 23 unsolved problems at the Internaitional Congress o Mathemateicians in Paris in 1900. This is maistlins reckoned the maist successfu an deeply conseidered compilation o open problems ivver ti be produced bi the ae mathemateician. Ower an abuin that Hilbert's wark anteicipated an asseistit a puckle advances in the mathematical formulation o quantum mechanics. Thir includes his introduction o Hilbert space, an Hermann Weyl's pruif o the mathematical equeevalence o Werner Heisenberg's matrix mechanics an Erwin Schrödinger's wave equation. His paradox o the Gran Hotel, a thocht on unco properties o the infinite, is aften uised in popular accoonts o infinite cairdinal nummers. that some sic axiom seestem is aiblins conseistent. There seems ti hae been baith technical an psychological raesons that he formulated this propone. It pruived his scunner at whit haed become kent as the ignorabimus, yet an aictive issue at his time in German thocht, that cuid be follaed back in that formulation ti Emil du Bois-Reymond. This programme is recognisable yet in the maist popular philosophy o mathematics, amang wirkin mathemateicians that is, maistlins cried formalism. For exemplar, the Bourbaki group adoptit a milk-an-watter version o it as guid eneuch for the requirements o their twin projects o (a) writin encyclopaedic foondational warks, an (b) uphaudin the axiomatic method as a research tuil. Houaniver Gödel's incompleteness theorem shawed in 1931 that Hilbert's grand plan wisna possible, as statit. The pynt 2 canna be combined with the pynt 1 in onie reasonable gate, sae lang as the axiom system is raelly finitary. Saidly for Hilbert, he leeved ti see the end o the kenspeckle mathematical dynasty at the Varsity Göttingen, as the Nazis ruitit oot monie o the kenspeckle faculty members in 1933. Aboot a year aifter the clair-oot, he gaed til a banquet, an was saeted neist ti the neow Meinister o Eddication, Bernhard Rust. Rust speirt, "Is't richt, Professor, that yer institute suffert sae muckle at the depairtin o the Jews an their freends?" Hilbert answert, "Suffert? Na, na, Herr Minister, it didna suffer. It juist nae langer exeists." Bi the time Hilbert dee'd in 1943, the Nazis haed mair-or-less guttit the varsity, as monie o the tap faculty wis aither Jewish or haed mairiet Jews. His funeral wis attendit bi feower nor a dizzen fowk, juist twa o them bein fellae academics. Wikimedia Commons haes media relatit tae David Hilbert. This page wis last eeditit on 27 Mairch 2017, at 18:43.